healthy pregnancy Indian desserts. Women get very special attention during Pregnancy from family and friends both. Cravings for a variety of foods at different time of the day is one of them. Many women crave for sweets in between meals or after sometimes even after meals. How about satisfying the mum-to-be’s sweet craving the healthier way. Avoid sugar loaded sweets, maida or cornflour and so on. Paneer, a good source of Protein and Calcium can also be used to create wonders in your own kitchen. Try making Kalakand energy and calcium packed also easy to make and quite interesting option to satisfy your cravings for sweets. The Fruit Sandesh is sure to send perky signals of delight to your brain! A rich sandesh topped with homemade orange sauce and an assortment of fruits, this dessert is a medley of all your favourite things. Kamlalebu Kheer is a Healthy Bengali Orange Kheer made of well-cooked cow’s milk, sweetened with little sugar, and perked up with chopped orange segments. This kheer is not overly sweet but the little amount of sugar and the natural fruity sweetness of oranges do their work well and satisfy your sweet tooth. Almond Til Chikki will top up your calcium levels. Just grab them at the time of snacks and enjoy their sweet taste. Try and opt for healthy flours instead to create recipes like Three Flour Golpapdi made by using 3 types of flour, a healthy way to indulge your sweet tooth. Wholesome flours of ragi, soya and whole wheat along with jaggery make this a protein an iron packed snack. Here is a delicious Nachni Ladoo recipe - A nutrient-dense and irresistibly tasty treat laced with cardamom, these ladoos help build your iron and vitamin B complex reserves. Walnut and Cashewnut Balls is one such sweet recipe, made of calcium-rich walnuts and cashews roasted in ghee and bound together with sugar syrup to satisfy your sweet tooth. Add in a few walnut based sweets to your diet once in a while to get in Omega 3 Fatty Acids which helps in baby’s brain development. So we have specially created recipes like Walnut Sheera, Mini Jowar Apple and Walnut Pancake in this section. 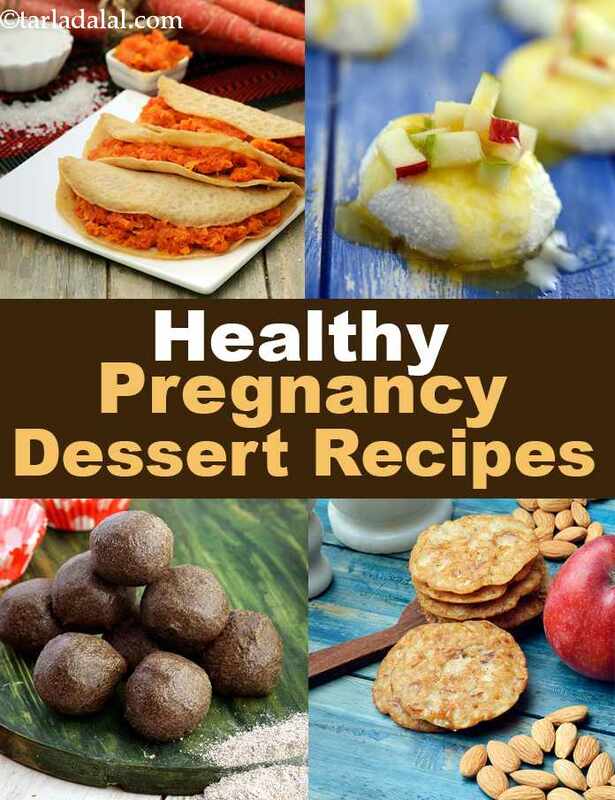 Enjoy all our dessert recipes to eat during pregnancy. Explore more varieties in our pregnancy section everyday. A sumptuous dessert, made from broken wheat, that is light enough to be eaten after a heavy meal when you still crave for sugar. It will nourish you with energy, protein and iron. Add fruits to it for flavour and texture.